E-mail may be accessed using 2 primary techniques. Hotmail and Yahoo mail are examples of web based mail services. The E-Mail stays on the internet so you can access it from any location and any device with a web browser. POP stands for Post Office Protocol but in reality, the definition has become blurred. Mail clients like Outlook, Thunderbird, Pegasus and so on, download your email into your inbox. There it may be red and replied to. If you use this technique to access your E-mail, we strongly advise you to back it up. There is a way to when you are away from your regular computer. 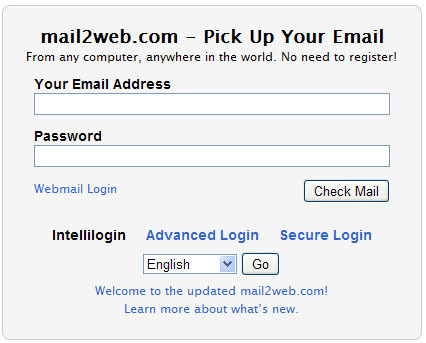 If you visit www.mail2web.com you can view and send E-mail. Enter your full E-mail address and your E-mail password and hit the 'Check Mail' button. Megganet has a number of web and mail servers, each offering a range of high end services to our clients. Megganet hosted email has the option of server side virus filtering and SPAM control. Megganet email works with Exchange server. If we host the clients domain name and web, we will be able to provide your engineer with full details. We can set your exchange server up ourselves. Megganet E-mail is available on any mail enabled device. We can provide you with the necessary settings. There are several techniques available to mobile devices for receiving and sending email - each with advantages and disadvantages. Get a phone provider to provide you with an E-mail address. The good thing here is that when there are problems - your phone provider will be able to help. The bad thing is that you loose your corporate identity as your email address becomes username @ mobile phone company.com instead of username @ nameofyour business.com. It is possible for you to have a phone provider E-mail address and we split your email in two at our server. One copy goes to your regular inbox and another copy is re-directed to your mobile device. We use a fix where email sent to your proper business address is also sent to your mobile phone address. The problem here is that you need to read and delete the email you get in your mobile phone as it cannot hold as mush email as your computer. The solution is to set up a seperate business email address on your mobile device. This also means that if you change your mobile phone company - you can keep your E-mail address. It is possable to set up Exchange mail on your phone. Your IT department should be able to do this for you provided your server is running Exchange mail and your mobile device can handle it.